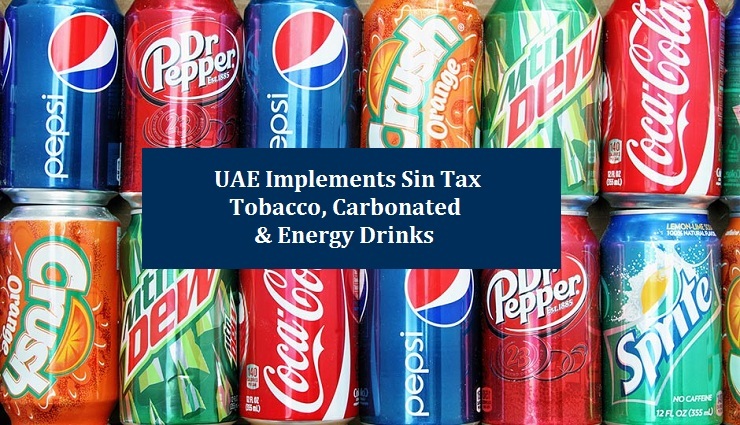 United Arab Emirate has imposed a ‘sin tax’ on tobacco, energy drinks and carbonated drinks. This tax has been implemented in UAE from 1st October 2017. After its implementation, the prices of tobacco and energy drinks will be increased by 100% while the price of soft drinks will increase by 50%. Sin tax is in fact excise tax that is laid on products that are considered harmful for society. The purpose of this tax is to reduce the use of these products by people and also to increase the revenues of govt. These taxes are easy for governments to implement as compared to other taxes because these things are not deemed to be necessity for public and the regimes can lay heavy taxes on such products without facing criticism. UAE is the second country in the GCC, after Saudi Arabia, to impose such ‘sin tax’. Both these countries have already announced their plans for the implementation of value added tax (VAT) from 1st January 2018. The other four GCC countries (Kuwait, Qatar, Bahrain and Oman) are also expected to impose VAT later in the same year. This ‘sin tax’ by Saudi Arabia and UAE is thought to be for preparation of the upcoming VAT. After implementation of ‘sin tax’, the prices of cigarette pack and soft drink in UAE have been increased from AED 8 to AED 16 and from AED 1.5 to AED 2.25 respectively. This tax will not be applied on current stocks and they will be available on previous rates. The UAE govt. wants to achieve two goals by implementing heavy taxes on these unhealthy products. This will not only increase revenue of govt. but will also force the people to leave or cut the use of such products that can cause lung cancer, obesity and other health problems. The GCC countries were considered to be tax havens as taxes and duties were almost completely exempted thanks to the revenue they were getting from high petroleum prices. But the situation has changed since 2014 due to fall of petroleum prices and now these countries are trying to adjust their economies by adopting new and more effective ways. Implementing taxes and duties on various products is one such method. UAE is quite a diverse economy as compared to most of the other gulf countries as it relies on other resources apart from oil and petroleum revenues but even this gulf state has to implement taxes on different products. It shows the difficult economic conditions that are faced by these gulf countries after reduction of oil and gas prices in international market. These changes clearly predict the dawn of a new era that is replacing the old time after oil discovery more than 50 years ago.